Short on HUR tokens? Pay with a credit card! We’ve added Stripe to our payment system, so if you don’t want to spend the tokens you’ve earned, pull out your Visa, MasterCard, or other Stripe-compatible card, and rack up those bonus miles, cash-back or whatever other credit card perks you’ve signed up for with your card provider. Just shop for items in the usual way, adding them to your cart. Check your Cart Summary. Is the Order Total in Dollars 0.5000 or bigger? You’re good to go. Click Checkout Now, fill out your shipping information, and click Next. 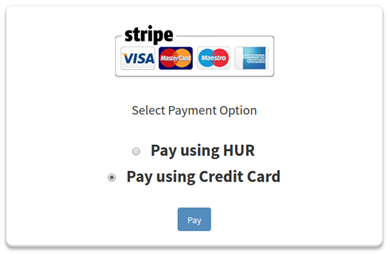 When the payment modal comes up, you can choose between Pay using HUR and Pay using Credit Card. After that, provide the credit card number, name, expiry date and CVC. Click Send. You’ll get a few messages and page redirects while our partners at Stripe coordinate with your credit card company to process your payment and keep everything safe and secure. Once that’s done, you’ll be back on our platform, with an order record ready for download, printing, and filing away.